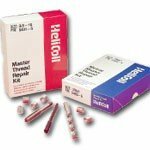 54017 -- MASTER REPAIR KIT HELICOIL 5401-7 7/16-14 by Heli-Coil at Chat Central Huron. MPN: 5401-7. Hurry! Limited time offer. Offer valid only while supplies last. Thread Repair Kit, Free Running, 304 Stainless Steel, Size 7/16-14, Length 0.656 In, Thread Type UNC, Number of Pieces 18, For Metal, Includes 6 Ea. Thread Repair Kit, Free Running, 304 Stainless Steel, Size 7/16-14, Length 0.656 In, Thread Type UNC, Number of Pieces 18, For Metal, Includes 6 Ea. 0.438, 0.657, 0.876 In Inserts, 1 Each of a Drill, High Speed Steel Tap, Tang Removal Tool and Installation Tool. If you have any questions about this product by Heli-Coil, contact us by completing and submitting the form below. If you are looking for a specif part number, please include it with your message.